Two fishermen say they rescued about 50 stranded and starving goats from a Big Island cliff last week but estimate that about 100 died from starvation or drowning during the rescue attempt. Questions remain on how the herd was apparently stranded on the remote South Kona shoreline cliff, 22 miles south of Kailua-Kona. Fishermen Stephen Cornacchia and Steve Arrington said they believe the goats were deliberately herded to a place where they were trapped, then left to die. But another fisherman, Sam Varron, said there are thousands of goats in the area, all able to jump and scramble over rock. "There's no way a goat could be stranded," he said. 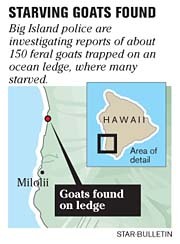 After being notified by the fishermen, state and Hawaii Island Humane Society officials investigated last Thursday and located the goats, said Debra Ward, spokeswoman for the Department of Land and Natural Resources. Hawaii County police are in the initial stages of an investigation and have not been to the site yet, said Lt. Randy Apele. State and Humane Society officials received reports of the goats from Cornacchia, who said he and Arrington rescued about 50 of the animals Aug. 28. Cornacchia said he and Arrington were fishing early that day when another fisherman told them he had seen the trapped goats from the ocean about 10 days earlier. After catching seven ono, they decided to look for the goats and found them near what is known to fishermen as the red hill cinder cone, near Kona Paradise subdivision, Cornacchia said. "We saw a lot of them were emaciated," he said. "Our best guess was there were close to 150 there." Cornacchia said the goats were on a rocky ledge facing the ocean and surrounded by a 6- to 8-foot-tall rock embankment. Both men said it was obvious the goats did not get trapped on their own. The pair believe the goats were herded and forced down the embankment. From the boat, Cornacchia said he could see about a dozen carcasses. But when Arrington reached shore, he said he saw about 100 dead animals. "It was a pretty gross scene," he said. He said carcasses were stacked three and four high, with flies everywhere. He also noticed that some of the carcasses had their ears and faces eaten off. Arrington yelled at the goats and clapped his hands to chase them into the ocean, where they could swim just 50 feet to another part of the shoreline not surrounded by impassible walls. Then he started throwing goats into the ocean. He said the goats were skin and bones and too weak to avoid his grasp. "I did what I could, then got out of there," Arrington said. The pair estimates about 75 goats went into the ocean, and about 50 made it around the wall to shore. They said the rest were too weak and drowned. Cornacchia said he pulled two young female goats on his boat and later released them near Kona Paradise subdivision. While Arrington was on shore, Cornacchia said he called his wife to report the stranded goats to whatever agency could do something. He said his wife did not reach the right officials. Cornacchia believes if officials learned of the goats a week earlier, 90 percent of the dead animals could have been saved. "This is about people doing the wrong thing," he said. "It's the inhumanity, the way the animals died. It's disgusting." Star-Bulletin reporter Rod Thompson contributed to this story. » Copper thieves, is it worth 5 years?